I want to sing a hymn on broccoli today. Or is it rather a hymn on my gorgeous kids? When I ask my son (4 years old) what he wants for lunch, he will probably say this: chicken (grilled that is), BROCCOLI, carrots, sweet potato (all steamed that is) and couscous. Wouldn't that make the heart of every mother on the planet jump with joy? And you know what, he finishes everything. I am so proud of him and the fact that he likes the healthy food I put in front of him. Even my daughter (2 years old and a very picky eater) nibbled away her broccoli the other day and even asked for the broccoli on her brother's plate too. Unfortunately, just a flash in the pan. The next day, she ignored it. I like any kind of veggies really. Once they are prepared the right way, I'll eat everything. Some of the magic keys (probably more for grown-up taste buds) seem to be chili, capers and anchovies. The blandest veggies they can spice up. They can make cauliflower tasty (check here) or spice up a simple and fast spaghetti dish (check here). 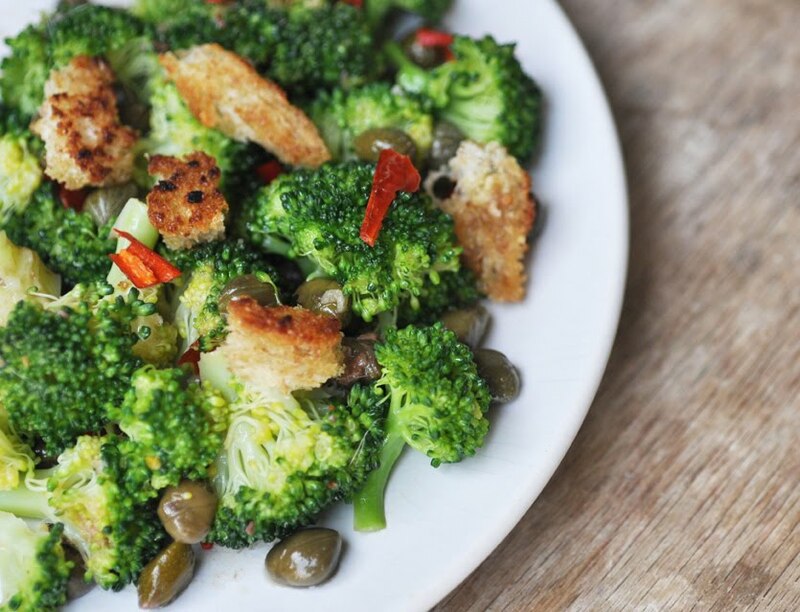 Now here is a recipe that makes broccoli the most delicious vegetable on the planet. Whatever is stated in the recipe I had over some brown rice for lunch yesterday. A brilliant combination, light yet filling and very tasty, especially with the garlicky -fried breadcrumbs on top. I am not sure if was just my imagination, but it really made me feel good and happy. Try it and let me know if it does the same to you. Steam the broccoli for about 5 minutes, until just tender. Set aside. Heat 2 tablespoons of olive oil in a pan and add the anchovies, capers, chili and half the garlic. Cook on gentle heat for 2-3 minutes. Set aside. Heat another 1 tablespoon of olive oil in a frying pan. Add the chunky breadcrumbs and rest of garlic and cook until crisp, crunchy and golden. Stir frequently. Drain on kitchen paper. Toss the broccoli with the flavored oil, tip into a dish then scatter breadcrumbs over. Serve as side dish or simply over brown or red rice for a light meal.